MSI has been teasing this new motherboard for a number of weeks, and today they have finally announced the Z270 GODLIKE GAMING. This subtly named model is the new flagship Intel Z270-based motherboard in MSI's Gaming series, and thus displaces the well-reviewed Z270 Gaming M7. Though now officially unveiled, MSI did not provide an extensive specifications breakdown for this new model. However, certain elements can be deduced just by looking at the motherboard itself. First and foremost, given its unusually large width, this is clearly an Extended ATX form factor model. This is most evident if you look at the amount of PCB space between the DDR4 memory slots and the edge of the motherboard. In that top-right corner you will also notice a debug LED, power and reset buttons, and the familiar MSI Game Boost Knob. The Z270 GODLIKE appears to have good storage connectivity, with one U.2 port, six SATA 6Gb/s ports, one USB 3.1 Gen2 header, two USB 3.0 headers, and three USB 2.0 headers. The triple M.2 slots with M.2 Shields are obviously one of the defining features of this new model. There are four steel-reinforced mechanical PCIe x16 slots, as well as a single PCIe x1 slot. The onboard audio duties are handled by the new AUDIO BOOST 4 XTREME implementation, which features fully isolated audio circuitry, an ESS DAC, and two audio CODECs that will allow gamers the option of using headphones and speakers at the same time. 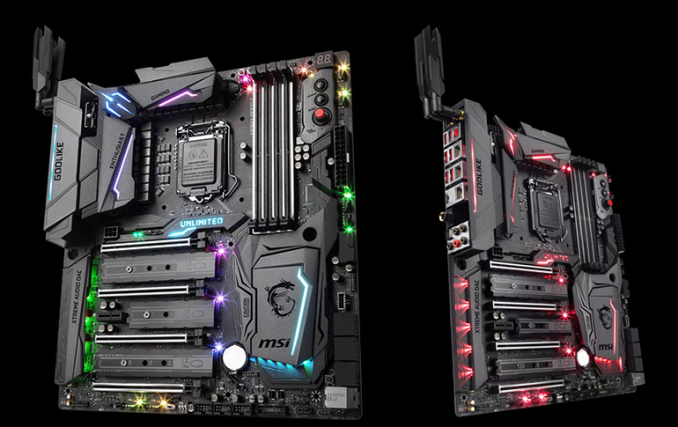 As you would expect on a gaming motherboard released in 2017, MSI's Mystic Light RGB LED lightning feature has clearly found its way to the Z270 GODLIKE GAMING. There are fifteen RGB LEDs spread throughout the motherboard, all of which can be independently controlled, along with a 4-pin header that can power an LED light strip. Thanks to the Mystic Light Sync integration, the included Phanteks Rainbow Strip can be made to match the colors and effects of the onboard RGB LEDs. This same sync concept applies to any future Mystic Light Sync compatible products. One interesting development is that the Z270 GODLIKE Gaming is going to be first motherboard to utilize the brand new ASMedia ASM3142 USB 3.1 Gen2 host controller. While we don't know much about the new controller, it is the clear successor to the ASM2142, which was the first USB 3.1 Gen2 controller connected with two PCIe 3.0 lanes and thus capable of handling up to 16Gb/s. ASMedia claims that the new ASM3142 controller will not only improve performance, but consume at least 50% less power than previous USB controllers. The performance claims are interesting, since the ASM2142 already had a pretty solid performance advantage over the Intel Alpine Ridge controllers. Another industry first - and apparently an exclusive feature - is the inclusion of Rivet's new Killer xTend technology. By combining the network capabilities of three Killer E2500 LAN controllers and an onboard Killer Wireless-AC 1535 WiFi module, Killer xTend essentially turns the motherboard into both a network switch and a Wi-Fi extender. How these network expansion capabilities work for a wired setup is that one of the three ethernet ports act as a WAN port - in other words the internet input - while the other two act as conventional LAN ports to which you can connect other PCs or even gaming consoles. The Wi-Fi module can be used to wirelessly connect the primary gaming PC to the internet, or as a 867Mbps wireless link to the other PCs/connected devices when using a wired internet connection, or it can even handle both wireless connections when acting as a Wi-Fi range extender. This removes the need to purchase additional networking hardware, simplifies configuration, and of course prioritizes traffic to the Killer-powered gaming PC over that of other connected devices. We have no word with regard to pricing or availability, but we definitely expect additional information at Computex 2017. You're not wrong, but the technical reason is that keystrokes detected over a PS/2 port are treated as hardware interrupts, which basically halts CPU's current processing to immediately handle what caused the hardware interrupt (in this case, it needs to immediately register that a key was pressed). It doesn't poll the port (as USB does) at a regular interval to detect if any changes happened, it simply registers the key stroke immediately. "Hardware interrupts are used by devices to communicate that they require attention from the operating system. Internally, hardware interrupts are implemented using electronic alerting signals that are sent to the processor from an external device, which is either a part of the computer itself, such as a disk controller, or an external peripheral. For example, pressing a key on the keyboard or moving the mouse triggers hardware interrupts that cause the processor to read the keystroke or mouse position."